A new age is upon Britannia. The great evil Lords are gone but our people lack direction and purpose in their lives. A champion of Virtue is called for. Thou may be this champion, but only time shall tell. 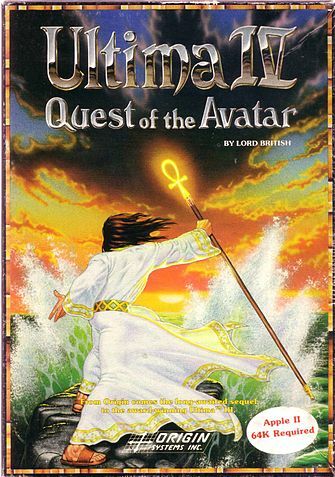 Ultima IV: Quest of the Avatar was a 1985 video game. No one can deny that Ultima IV was a masterpiece. It catapulted several new concepts into the notion of role-playing, and the graphics and music were groundbreaking at the time (and frankly, still are). In the Magical Land of Britannia... all of the Big Bads are dead. The evil Wizard Mondain. Dead. His Apprentice Minax. Dead. Their child/demon/computer...thing; Exodus...defeated. While there's still dungeons and random monsters; there is no goal anymore. Nothing for the people to hope for; no more heroes for them to emulate. Can there be Good without an external Evil to fight? The magical ruler of Britannia, Lord British, summons the Stranger of old who defeated those evils with a very new, very different task. Become the Champion of Virtue for people to have a goal to achieve. Master the 8 Virtues and find the Answer to this postmodern dilemma in The Codex of Wisdom, located in The Great Stygian Abyss. Fulfill the Quest of The Avatar. A freeware version of the game with virtual Feelies is available on GOG.com. Arc Number: 8. There are eight virtues with eight shrines dedicated to them, eight character classes, eight major towns in Britannia, and eight dungeons with eight levels each. Broad Strokes: Looking back at the first three games, the events of them weren't...quite as described by Ultima IV. Time Travel may explain some of it, but by this time the general rules and definitions have solidified. Dialogue Tree: One of the earliest examples of the concept, in PC versions of Ultima IV one could have limited conversations with everyone in the towns. Later games would make it easier to come up with topics; this one made you type each one out. "Name" and "Job" were the common opening lines; and then later Arc Words tended to be important. The only three words that all NPCs were guaranteed to respond to were "Name" "Job" and "Health". Occasionally a NPC in their dialog would let slip a subject that you could then bring up to another NPC - which would reveal that subject him once you asked. Since this could lead to Sequence Breaking; later games made the spell out the conversation topics depending on what information flags you encountered. Doing In the Wizard/Doing In the Scientist: The elves, dwarves, halflings, and Ewoks that were playable races in the previous three games have been retconned out of existence, as have the spaceships, time travel, and other anachronistic elements. Dungeon: There is still fighting in this game and 8 dungeons with various MacGuffin. Dungeon Bypass The white stone is hidden up in the mountains north of Britain and to get to it you need to descend to the bottom level of a dungeon via a hidden entrance behind Lord British's castle, climb your way back up to an exit on the other side of the world, board a hot air balloon, and guide yourself to a landing space the size of a single tile with the wind-change spell. You can also just use the Blink spell (warp a distance on the world map) in the right spot and warp to it. Exclusively Evil: Most (but not all) of the creatures you will encounter in the wilderness and dungeons are this. Feel free slaughtering the evil creatures, but let the non-evil ones flee. Sadly, played straight in the NES version. No monster you encounter in the game will run from you, forcing you to kill any monster you randomly encounter. Faux First Person 3D: Used in the dungeons. Fighter, Mage, Thief: The first three character classes are called Mage, Bard, and Fighter, though the Bard class doesn't have any abilities related to music, and is actually a generic RPG "thief" character in all but name. According to the Word of God, the class was called "Bard" because "Thief" implied dishonorable behavior, and therefore didn't fit the game's theme of becoming virtuous. The other classes are variants of the first three, except the Shepherd, which has the strengths of none of the other classes. Fission Mailed: Many players Rage Quit and reloaded when their boat was sucked into the whirlpool, since the game went black and you got the same initial text that you got when you died. Except... it's one of the only ways to get to a town with a Plot Coupon. D'oh! Functional Magic: Like traditional games, required the correct Magic Points, skill levels, and such; but also required you to have the right combination of magic ingredients. You were expected to know and remember each recipe; whether by instruction guide or NPC. Genre Shift: The NES port plays much more closely to an eastern RPG than a western one, streamlining much of the gameplay and introducing Random Encounters. Guide Dang It: This game was very different at the time. There was no Gamefaqs. The items required to complete the game can only be found through the "search" command. Their location can be hinted at by friendly characters, but otherwise the spot where the item is supposed to be appears perfectly normal and featureless (not always, though). The dialog file of a character that was supposed to give you a hint to the final riddle was mistakenly removed from the game, leading to a number of people struggling through the game only to find themselves stuck on the last puzzle. This gave rise to the Ascended Glitch character Smith the talking horse, who appeared in several later Ultima games, always giving you important hints about the *previous* game. On the NES remake, you will probably wonder why some of your virtues such as honesty keeps going down despite answering to the best of your ability to be virtuous. Answers are about humility, more than honesty. It takes a bit of trial and error to identify which conversations hold this trap. Joke Character: If after taking the intro quiz your highest virtue is humility then you get the shepherd class. Leather armor, a marginally better weapon selection then the mage, no magic, a poor trap disarming ability (though no worse then that of over half the other classes), and you start the game at a lower level than the other classes, stranded on an island infested by demons with no shops and no clear way out. On the other hand, there is a Magikarp Power potential here. If you know what you're doing it's fairly easy to level up quickly. Once you do master the powers of the Avatar, you can equip anything and cast any spell; even if you're a Shepherd. Since you still need each of the other classes in your party to get to the bottom of the Abyss, you no longer have a useless party member. Karma Meter: The Trope Namer. "Karma" was how well the character acted in the 8 Virtues. Honesty, Compassion, Valor, Sacrifice, Justice, Honor, Spirituality, and Humility. Each of the 8 were determined by actions you made. Run from a fight, and lose points in Valor. Unless you're running from a natural animal who is just hungry; such as a common serpent; and then you're adding Compassion. It gets complicated. In fact, just see the Trivia section. Monster Town: Magincia has become this since its location has become so uninhabitable that every human except for Katrina is either dead or has moved away. The monsters will only attack you if you attack them first, though. The Moral Substitute: According to The Official Book of Ultima. The concept for the game came about when Garriott noted Moral Guardians' response to the first 3 games. This is one of the few examples of this trope where the series actually gained more depth and character because of it, rather than the opposite. Nintendo Hard: Of all the playtesters, only Richard Garriott himself actually finished the game before it was released. If you can complete the game without using internet spoilers, you deserve a medal. The Paragon: The main reason you have to become the Avatar is so you can serve as an example for the rest of the world to follow by living virtuously. Player Personality Quiz: Possible Trope Maker. Unlike the previous games where you specified your characters' class and stats directly, you now have to answer seven simple questions on how you would act in certain dilemmas. This determines your character class, starting location and your initial standing on the game's eight Karma Meters. Post Modernism: The only goal is to live virtuously. Read the Freaking Manual: The game directly tells you to read the included The History of Britannia in the intro (you should read The Book of Mystic Wisdom as well, despite your character not daring to open it). Schrödinger's Player Character: Whichever class you choose, the same character of that class will still exist in their corresponding town, but will not join the party. Similar to Super-Hero Speciation. Curiously, sequels will indicate that they all were in the Avatar's Party. Shoehorned First Letter: The games has both a command and a spell for each letter of the keyboard, leading to some oddities like (x)-it, (k)limb and (z)tats. So What Do We Do Now? : An entire game made of this trope. What do you do when evil has been defeated? Become a messiah! This page was last edited on 20 February 2019, at 14:11.